I forgot for a moment that I am now a food blogger and did not take a picture of the completed brioche so please accept these prep shots in its place. I made brioche a few years ago as part of my attempt to make every cake in The Cake Bible. Although that book has some very misguided advice on what to do with it after it’s baked, the actual loaf was spectacular. Keller’s is also good but more complicated. But just in a time-sucking way. Like pie crust, yeast dough seems to make many people feel instantly defeated. If you’ve ever had yeast not proof and then wasted hours trying to get bread to rise that stubbornly refused, you probably decided that yeast-based bread was just going to be one of those things that you would never comprehend, like credit default swaps or your cable bill. You were so wrong. Once you get the hang of it it’s easy and very rewarding. I think what trips most people up is proofing the yeast and most problems with proofing are due to water that is either too warm or too cool. Most recipes will specify the temperature of the water (or other liquid) and you should use an accurate thermometer to make sure your water is just right. I have a thermapen and it has changed the way I cook everything. It is not cheap but it’s the best and you will never again have to guess what temperature your frying oil is, or your yeast water, or your Thanksgiving turkey. I probably use mine 2-3 times a week. For the Ad Hoc brioche, my original plan was to make it Saturday and use it for the Leek Bread Pudding Saturday night (can you hear Thomas Keller snickering in the background?). That was before I got to the “refrigerate overnight” part of the recipe. So there’s a 3-hour rise, an overnight stay in the fridge, a shaping, followed by another 3-hour rise, followed by 40 minutes in the oven. It does make two loaves though so your efforts are rewarded. I’ve decided that brioche is just a means of holding butter together — similar to puff pastry — and I’m all for that. It’s like a regular bread dough in some ways but wait until you try to handle it. That’s when you can tell that there are 2-1/2 sticks of butter and 6 eggs in it. It’s more like a cross between bread dough and cake batter. A couple more tips on yeast breads: you can see in the photo that I use a nifty plastic tub for bread (and many other things, like brining chicken) and what I love about it is that it’s marked so you know exactly when your bread has “doubled in size.” Cambro is the company that makes them and I bought mine on the King Arthur Flour website but you can get one at a restaurant supply store and Amazon has a good selection. Williams-Sonoma probably has one for $75 if your’re in the mood to be fleeced. Second, if you want to speed along your rising, or it’s paticularly cold in the room your bread dough is in, use a heating pad. I actually keep mine in the kitchen and I just plug it in and put the container on top of it for just the right amount of additional heat. Sift together the flours, sugar and salt into the bowl of a stand mixer fitted with the dough hook. Add the eggs and beat for 1 minute at low speed, scraping down the sides with a rubber spatula as needed. Slowly add the dissolved yeast and continue beating at low speed for 5 minutes. 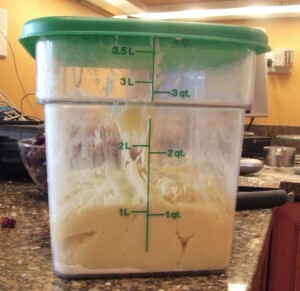 Stop the machine, scrape any dough off the dough hook, and beat for another 5 minutes. Add the butter cubes, about one-quarter of them at a time, beating for about 1 minute after each addition. 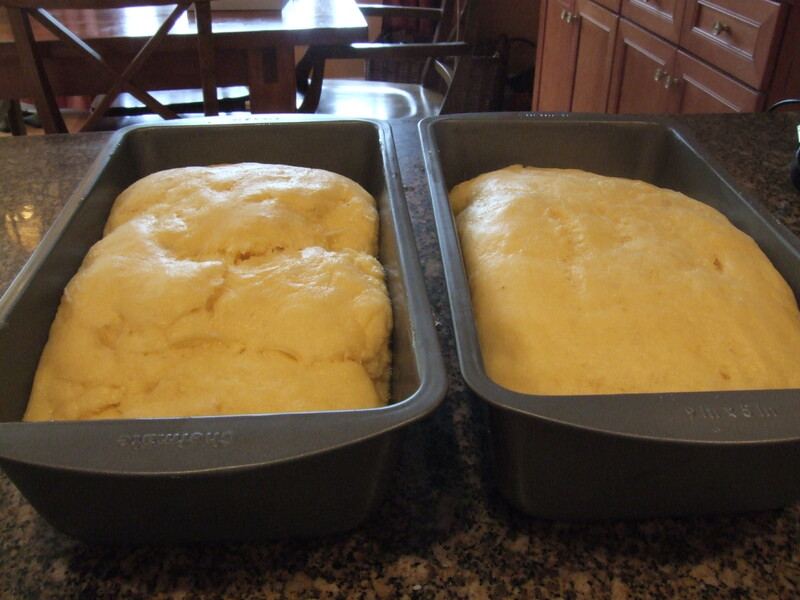 Once all the butter has been added, beat for 10 minutes more, until the dough is smooth and silky. Transfer the dough to a large floured bowl and cover with plastic wrap. Let stand in a warm place until doubled in size, about 3 hours. Turn the dough out onto a generously floured work surface and gently work out the air bubbles by folding the dough over several times while lightly pressing down on it. Return the dough to the bowl, cover with plastic wrap, and refrigerate overnight. Generously butter two loaf pans. Turn the dough out onto a floured work surface. With floured hands, divide the dough in half, shape it into 2 rectangles that fit into the loaf pans, and put the dough in the pans. Let the dough rise, uncovered, in a warm place until it is about 1/2″ above the top of the pans, about 3 hours. Bake the brioche until it is well browned on top and sounds hollow when tapped, 35-40 minutes. Remove from the oven and immediately turn the brioche out onto a cooling rack. If serving immediately, let the bread cool for 10 minutes, then slice. If serving within a few hours or up to 2 days, promptly wrap the hot bread in aluminum foil and set aside at room temperature until ready to use. To freeze, wrap the hot bread in foil and promptly freeze. The bread can be frozen for up to 2 months; when ready to use, reheat, un-thawed in the foil, in a 250-degree oven for 20-25 minutes.